Freshly made paneer is incomparable. Homemade makes it really the best available option. See how the paneer is porous and so soft that it can bend and take a new shape while it is still hot. I took this picture while the paneer was still hot. 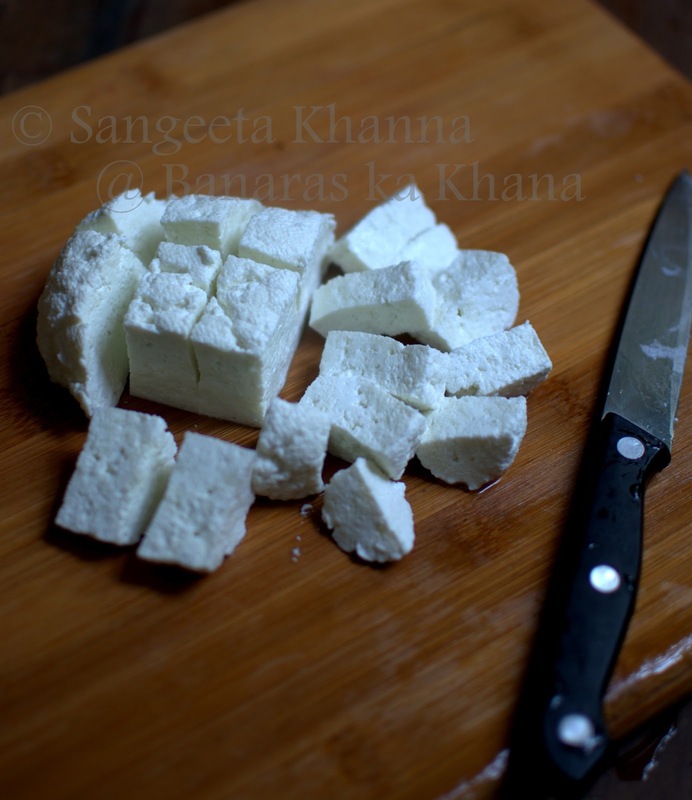 Just pick up a cube a eat it to believe how different and how much better it is from the store bought paneer. 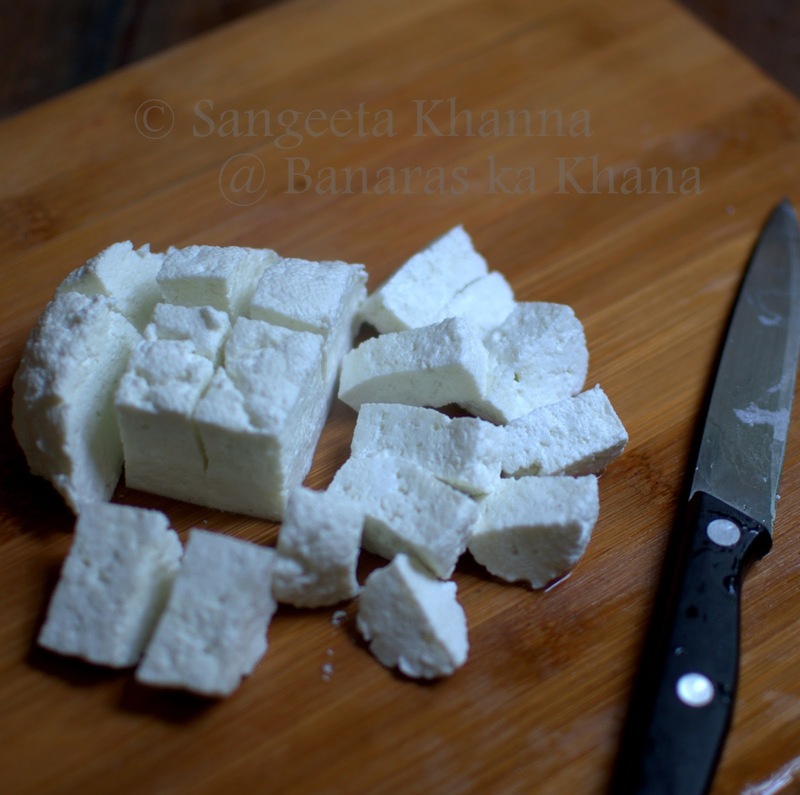 You can make paneer within 20 minutes time if you need about 200 gm of paneer. This time is mostly the time required to bring one Liter of 3% milk to boil. After that it takes only about 2 minutes to curdle and then 2 more minutes to strain the whey and get the paneer. That is just about 5 minutes of your time when your hands will be engaged into real work. The time when the milk is brought to boil, can always be used to do other chores in the kitchen. To make paneer, bring the milk to boil but watch the milk as soon as a thin layer of fat starts accumulating on top and starts making wrinkles and bubbles from the sides.The temperature should be around 90-95 C if you are using a milk thermometer. The curdling of milk at this temperature results in softer and more porous paneer as the milk solids coagulate slowly. The acid (lemon juice or vinegar) is also added slowly so the curdling is slow. Keep stirring the curdling milk so you can see the whey separating and know when it is ready to pass through the colander. 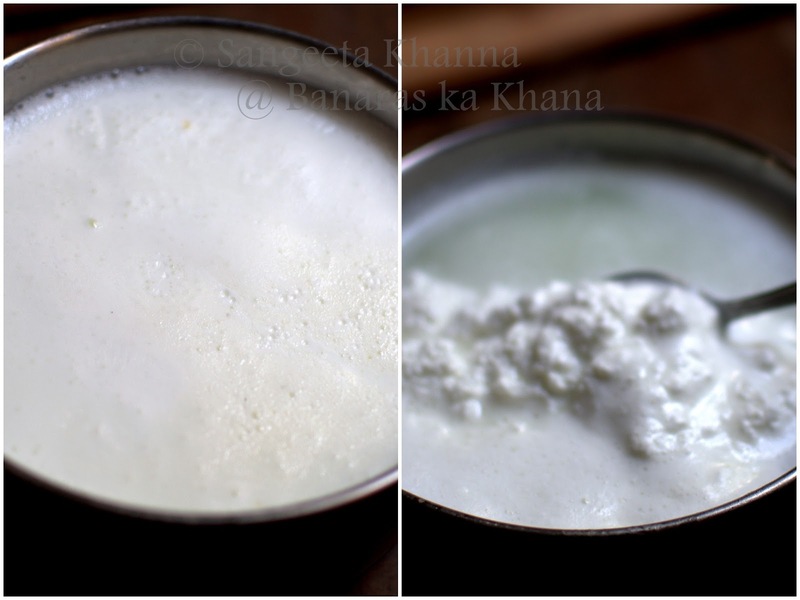 If the temperature is too hot or the acid (vinegar, lime juice or yogurt) is added too quickly, the milk solids coagulate quickly, leaving no pores and the paneer turns hard. So take care to let the paneer curdle slowly, taking about a minute's time and then pour the contents of the pan through a muslin lined colander. I use a steel sieve which can be fitted on another pan to drain the whey. The contents of the pan are emptied into the sieve, the coagulated milk solids (paneer) is propped up in the middle, if it has spread all across the sieve or colander, and then it is tossed once and turned upside down so you get an almost smooth finish even when you are making a small quantity. For larger quantity you always get smooth finish as the weight of the paneer made, makes sure it gets smooth by the force of gravity. The paneer can be transferred to a bowl if making a small quantity, to make sure it takes a shape that can be cut into nice cubes. It will keep releasing some whey and does not need to be hung to drip. Just take out form the bowl and cut it into pieces of desired size and shape. Or mash and knead to make Rasgulle. How about making some fresh palak paneer? For that I would steam spinach while the milk boils, puree it nicely, add butter and salt n pepper to the green puree and then mix with paneer when it is ready and simmer for a couple of minutes. Quick and tasty meal is ready. And do not waste the whey. It is a great source of proteins so use it to knead dough, make pancake batters or use it o make soups or drink it as it is. It is a great mild laxative that nourishes your gut as well. Making paneer at home has double benefits you see. Have you been scared of making paneer at home? Did this post help you? Please do write to me if it did. Oh ! so dont you need to wash it with cold water and be rested under heavy load? sounds too easy I am so glad.Thanks Sangeeta,I am sorted by this recipe for a large number of dishes I make. Did I tell you my my lemon ginger dates pickle is a great hit. I owe you thanks for that too. dont we need to put weight or in refrigerator to make paneer cubes? how could u get cubes? There is no weight or refrigeration required. The cubes are made in this picture while the paneer was still hot to handle. You can see the porosity also. Please follow the recipe of making paneer carefully as written here and you would never fail in getting neat cubes. Read this...If the temperature is too hot or the acid (vinegar, lime juice or yogurt) is added too quickly, the milk solids coagulate quickly, leaving no pores and the paneer turns hard. So take care to let the paneer curdle slowly, taking about a minute's time and then pour the contents of the pan through a muslin lined colander. I use a steel sieve which can be fitted on another pan to drain the whey. Let me know if you get it right next time. Thanks. Hi, there! Thank you so much for this detailed tutorial.. it gave me the confidence to try making paneer at home for the first ever time. No one in our family has ever made it before so, you see, it was quite a big step for me. :) I have the following questions, and it would be great if you could answer them. 1. I set 1 litre of full-fat milk on high flame till it started forming a film on top, like you said. Then I added 2 tablespoons of white vinegar and switched off the gas. Nothing seemed to happen, so I switched the gas back on, and kept stirring for a while. I saw the milk splitting. but even after about 3 more minutes on the stove, the whey was like proper milk and not watery. Did I use too little vinegar? 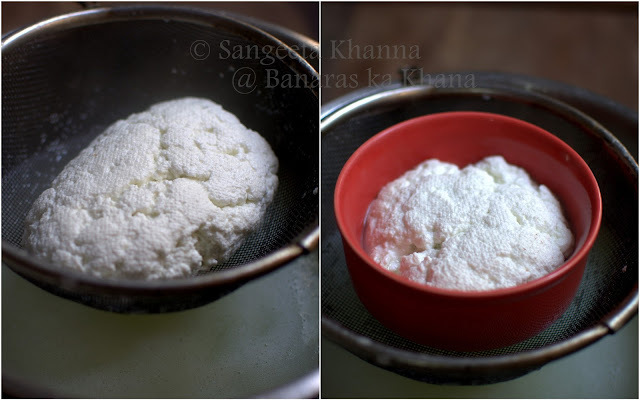 2. i also got very little paneer when I poured the curdled milk into a muslin-lined colander. About 100 grams I would say. Why so? 3. The paneer isn't very soft, probably because I kept it on the stove too long? Thanks for writing in thegalnxtdoor. Looks like you are using milk which is homogenised and ph balanced. Try keeping the heat low next time and use whipped yogurt to curdle the milk, keep adding till the milk splits leaving a clear whey. It it doesn't work it means you need to look for raw milk. Where are you located? So sorry for the delay, I was traveling.